The feature is displayed in the top menu bar, right in between the “Notifications” and “Messages” tabs. According to the social network, Moments help users find the best of what Twitter has to offer, regardless of who a user follows. It is important to note that when a user clicks on a Moment that are directed to an introduction with a title and description for that story. From there, they can view additional information about the specific piece of topic, including images, autoplaying videos, Vines and GIFs. Users can also interact with content by favoriting a Tweet, Retweeting and more. It is important to note that users can tell if a story has been updated since their last view when they see a blue dot in the upper righthand corner of the image associated with the Moment. Plus, users will see an option to follow stories that are updating frequently (like sporting events), so that they can keep track of the latest updates in real time without having to switch between tabs. After the story ends, the tweets will also stop. It will be interesting to see the engagement with this new feature and if Twitter will be able to monetize it in the future. The social network notes that most of its Moments are assembled by its curation team and contributed by partners like Bleacher Report, Buzzfeed, Fox News and more. 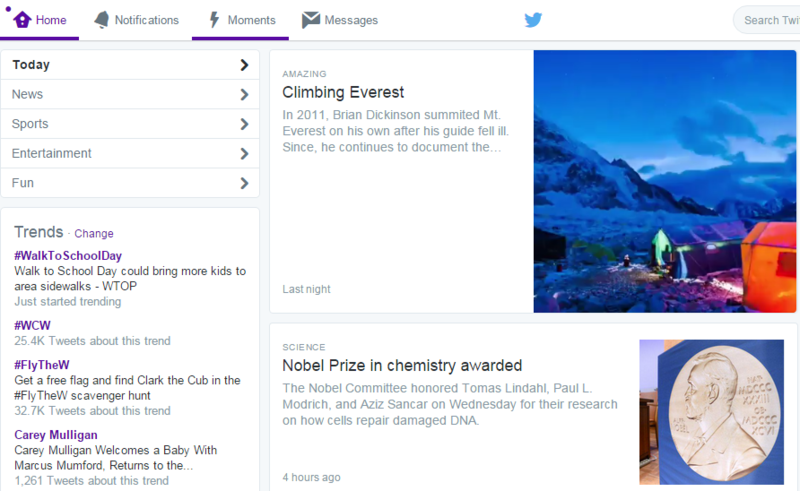 That said, Twitter says it’s looking forward to seeing new and exciting uses of Moments from more partners soon.